Following the theme of computers, the acronym AFK stands for "away from keyboard". This phrase is typically used when you walk away from your keyboard to go do something else. So by attending the event, you are technically walking away from your keyboard to go to meet others from the community! I have never been to Razer's AFK event before. This is my first time being invited. I wasn't really sure what to expect, but I had a feeling it was going to be interesting! 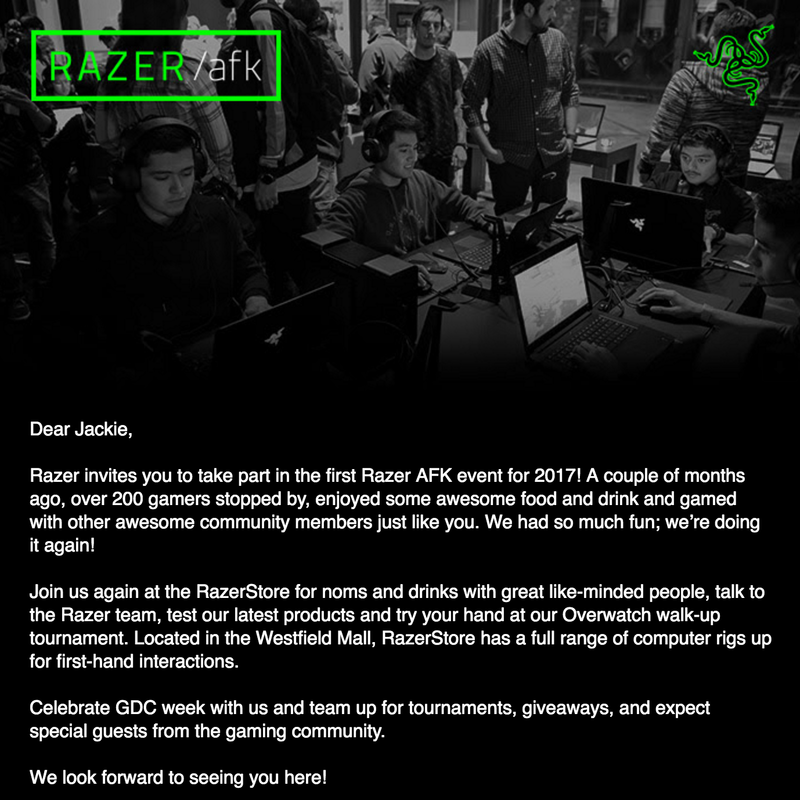 I think it's pretty cool that Razer holds community events for their customers. In a small way, it made me feel special for being invited :]! C-dawg takes a photo as we drive to the event. 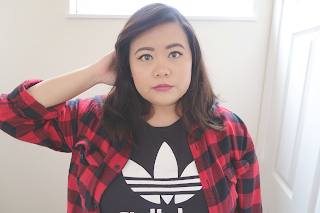 I know this photo is pretty blurry, but I like the way that it looks! We waited in a line for about 30 minutes to get into the event. Once we got to the front, we showed the Razer employees our ID's and tickets. In return, they gave us a green wristband (to denote that we were over 21) and a handful of raffle tickets. They ushered us in and we realized how packed the event truly was. Lots of people were standing and taking photos of Razer's new laptop, Project Valerie. I remember the first time I heard about this laptop with three 4K displays. It made headlines because the prototype was stolen at a press conference. This time around, the laptop was showcased behind a thick glass case. Honestly, it looked really cool even from behind the glass. Of course, having a laptop with three screens seems a bit ridiculous. Can you imagine carrying this around with you? Nonetheless, the lighting and color on this laptop was very vibrant! It must be very fun to play games on this laptop with so many screens. It slightly gives off the "I'm doing too much" vibe, but it does seem cool though! Of course, I must say that I am no tech reviewer. If you want more information on the laptop itself, I've included a link up above and you can check it out for yourself! A small Overwatch tournament occurred at the event. Basically, anyone could walk up to the laptops and play the game. At the end, I believe there were prizes that were given away for winning the tournament. There was a small part of me that wanted to try playing Overwatch on these Razer laptops, but it was a bit intimidating. Everyone was watching and I've actually never played Overwatch before! I didn't want my first experience of Overwatch to be so intense. Perhaps if I were 20% braver, I just might have hopped on and played. As previously mentioned, we were given a handful of raffle tickets. Razer held a small raffle at the event! 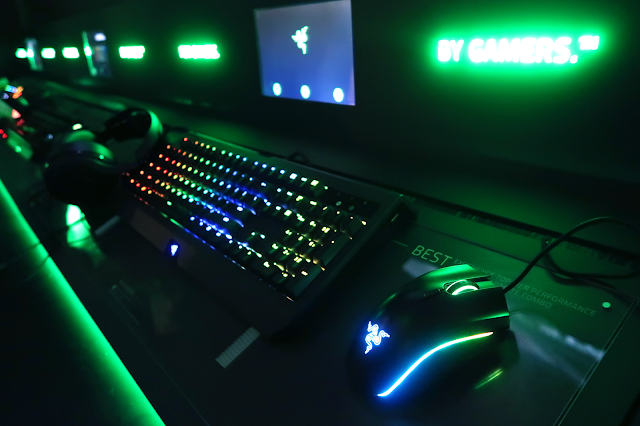 The prizes that were given away ranged from a poster to Razer's Blackwidow Chroma V2 keyboard. I kept my fingers crossed that we would win something in the raffle, but luck was not on our side. We left the event empty handed. Of course we didn't get upset over it! I think we were both happy to get free wine and burritos! I consider that to be a winning situation! Shoutouts to my sister C-dawg for being 2nd photographer / scouting out the burrito stand. Thanks for being a trooper and standing in line with me, even though you don't play video games or own Razer hardware. You a true MVP! 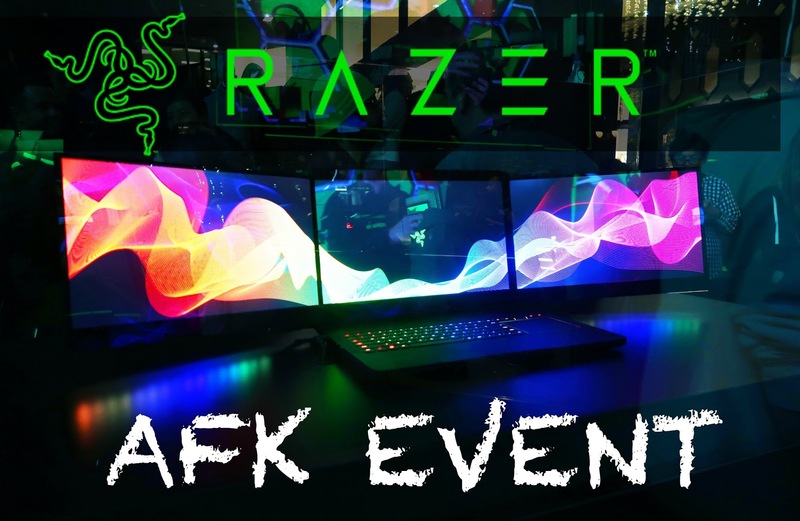 So now that I showed you what happened at the Razer AFK event, I just wanted to share some of my personal experience with Razer's hardware! By the way, I just gotta put it out there that this is not a sponsored post. (LOL I wish right?) For more information on sponsored posts I have a page on advertisement and a separate page for contact information. Check it out! I am currently using Razer's Blackwidow Chroma keyboard and Deathadder Chroma mouse. Yes, I already know what you are thinking before you say it because I've heard it a million times before. That is a 27in iMac. Yes, I use my Blackwidow Chroma with a Mac. Yes, I am aware that this keyboard is meant to be used for Windows. I believe Razer used to have a version of the Blackwidow Chroma that was compatible with Mac. Unfortunately, I don't believe they make it anymore. 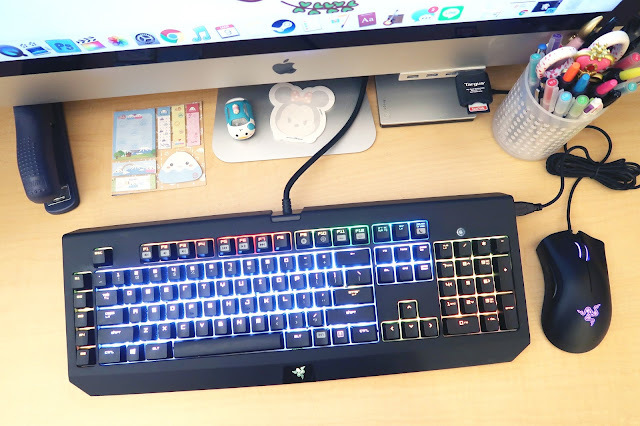 You can still use Blackwidow Chroma with Mac. You just need to go into your keyboard settings and change up the function keys. Although a bit time consuming, it is not difficult at all! There are a lot of online tutorials that show you how you can do it! So why the Blackwidow Chroma? Well back in the day, I used to play all of my games on this super tiny Mac keyboard that came with my computer. It works just fine to be honest, but the arrow keys were a bit small. I decided to go for something a little bit bigger and I wanted something that matched the Deathadder Chroma mouse that I got. The Blackwidow Chroma keyboard just seemed like the right choice so I decided to get it! In case you were wondering, I got the stealth version of the keyboard (the orange switch)! It's supposed to be a little bit quieter than the Razer green switch. Although from all the Youtube videos that I've watched, I don't really hear much difference between the orange and green switch. 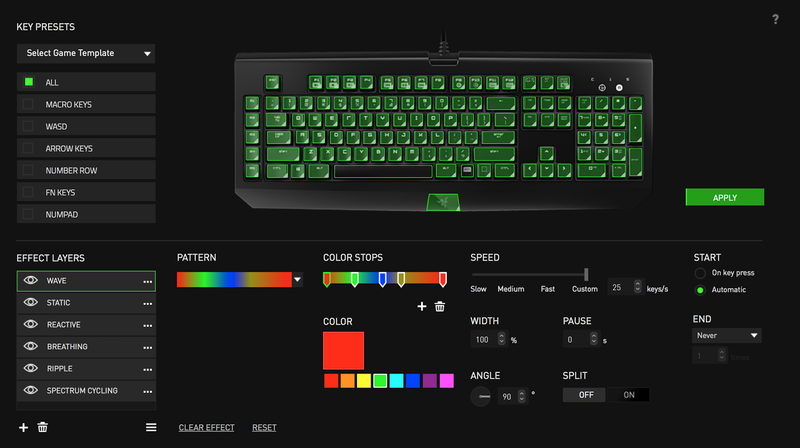 I guess the green one sounds slightly more clicky than the orange one? I didn't know this, but Razer now has a new yellow switch?? At the time I bought my keyboard, this wasn't an option. I'm not sure if I would've picked the yellow switch over the orange one though. I really like this keyboard because of all the lighting effects! Coming up with new lighting effects is all part of the fun! You are given so many different options that you can literally create any color combination that you want. It takes a little getting used to, but with time you can seriously create some cool patterns and effects. 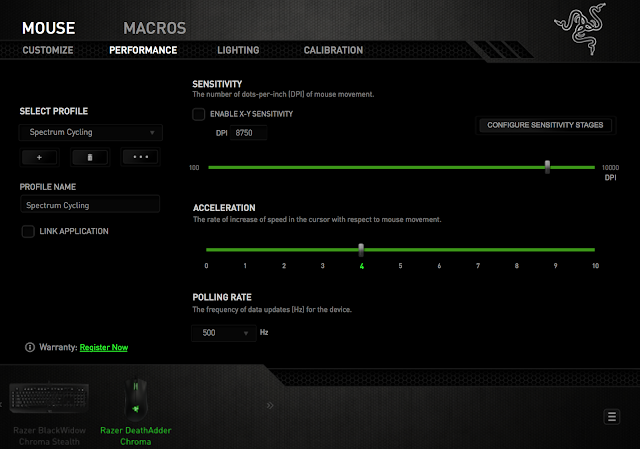 You are given up to 10 lighting profiles on the Razer synapse. If you run out of space, you can always export your lighting creations and re-upload them on to the synapse. I think it's cool that you can export your creations. It gives you the chance to share them with others as well! I've seen some really cool ones online. Speaking of the Razer synapse, I must take the time to say that it can be quite terrible to use if you have really bad wifi. I also think it's kind of dumb that you need to be logged into the Razer synapse to access the Chroma Configurator. Out of everything, I think Razer's synapse gives a lot of people a hard time. Yes, your lighting effects still work if you aren't logged in. However, if you customized certain function keys on the keyboard, you need to be logged in for it work properly (which I think is so dumb :/)! 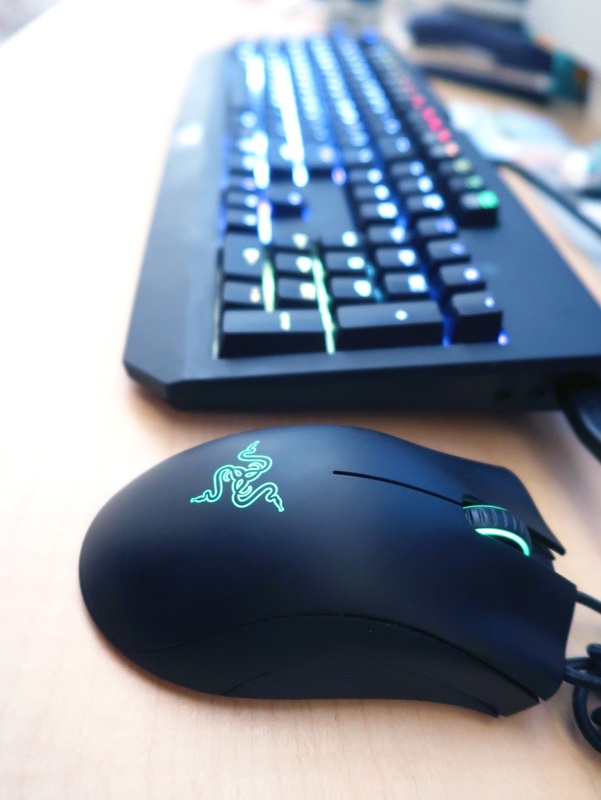 So the main reason I got the Deathadder Chroma was because for the longest time I was playing games using a trackpad. Oh man, those were some dark times. I have no idea how I made it through playing the beginning parts of SOMA with just a trackpad. It was such a bad time! Eventually trackpad just wasn't cutting it anymore, I needed something more. So I stumbled across the Razer website and decided to try out the Deathadder Chroma. Before I get into it, I should probably mention that I use a mouse pad with my mouse so people won't think I'm a monster LOL! My mouse pad just isn't shown in the photo above. I am seriously on the hunt for a new mouse pad though. I think the current mousepad that I'm using is interfering with my mouse? I'm not too sure. Once again back with the Razer Synapse. I guess you can say that I set my mouse to a pretty high sensitivity and acceleration. Although, I had to tone down the acceleration because playing Tomb Raider with such high sensitivity gave me motion sickness! (LOL it was not a fun time) Luckily, you can have multiple profiles for you mouse. You can set it to any speed & acceleration (depending on the game you're playing) and switch back when you feel like it. The first thing everyone always says when they use my computer for the first time is, "Your mouse moves too fast!" I never really noticed that mouse speed actually matters to people until I've used other people's computers and realized their mouse moves really slow. I guess I've always liked setting my mouse on a faster speed? I like the acceleration. You can move your mouse all the way to the other side of the screen in less than a second. It's awesome! There isn't much lighting effects on the Deathadder Chroma (at least in the version that I have)! I currently just have in set on spectrum cycling. I was a bit sad to find out that the new Deathadder Elite has more lighting profiles!! I am mad jelly. Other than the colors and mouse settings, there really isn't much else I can really say about the Deathadder Chroma. It's a mouse. It looks pretty cool. I don't have to play SOMA using a trackpad anymore LOL! So far, I've had a lot of positive experiences with both the Blackwidow Chroma and Deathadder Chroma. Currently, I am on the hunt for a new mouse pad to use with the mouse. If you have any suggestions, let me know! 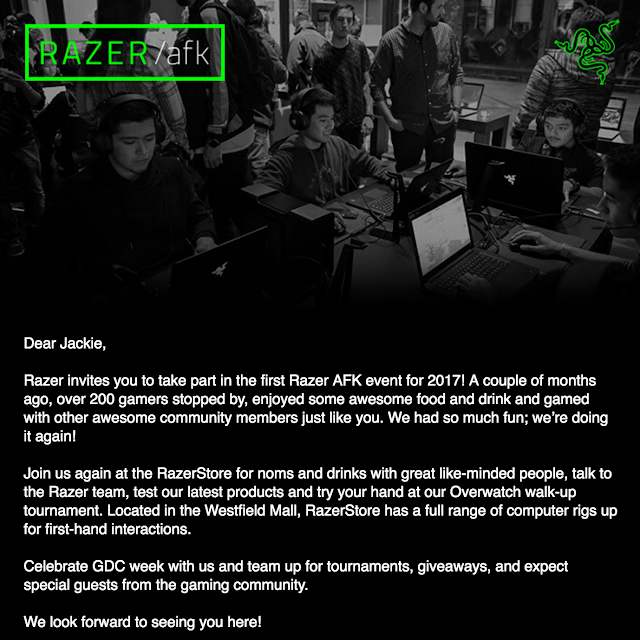 Also, thanks for the invite Razer! The event was pretty fun and the free food was awesome! 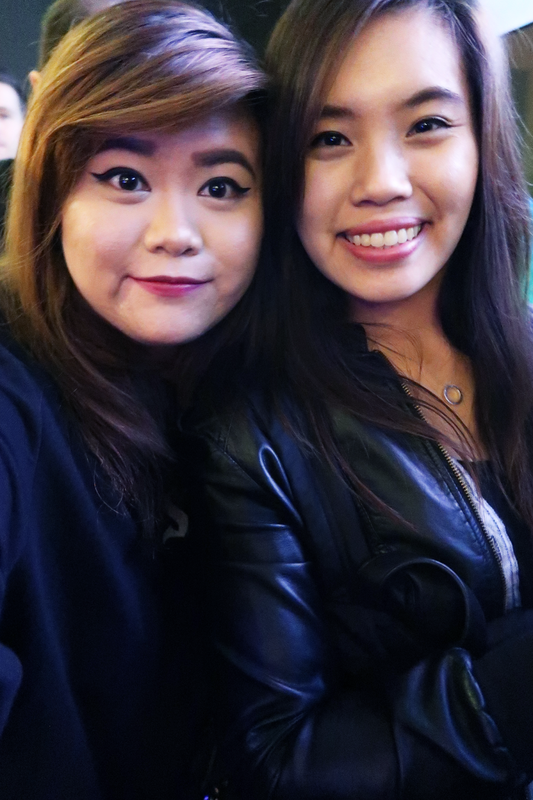 Please invite us again in the future :]!